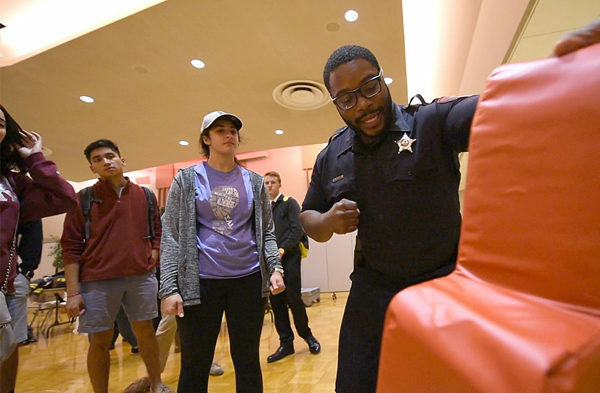 “With self-defense classes, late night transportation services, 24/7 patrol and a police department that staffs over 50 officers who are medically trained and have advanced law enforcement experience, safety at Northern Illinois University is a constant priority.” – Chief Thomas R. Phillips, Sr.
At Northern Illinois University, community safety is our top priority. That’s why we we’re extremely proud to be included in the top 100 rankings of the Safest Colleges in America 2017 report. The National Council for Home Safety and Security created this ranking using the most recent data from the FBI’s Uniform Crime Reporting and the National Center for Education Statistics. They assessed more than 2,000 U.S. colleges and universities. Top-ranked colleges boast low overall crime rates (off campus) and maintain safe campuses with little or no crime. This is the second consecutive year that Northern Illinois University has received national recognition for community safety. In 2016, the NIU was recognized by College Choice as one of the 50 Safest Large Colleges and Universities in America. The university’s main campus is a located 60 miles west of Chicago in DeKalb, Illinois. NIU Police Chief Thomas R. Phillips, Sr. commented that “public safety is truly a team effort”. The NIU Department of Police and Public Safety works closely with the DeKalb Police Department as part of their collaborative-policing effort. Many of the 20,000 students reside on campus or in the DeKalb neighborhoods close to campus so there is a lot of crossover between the two police agencies to meet the safety and security needs of the community. Once on campus, you can get more information on staying safe, ranging from simple safety tips on how to safeguard your property to basic self-defense and to classes on how to react in emergency situations. We also offer free services to make sure you get where you are going safely. The Huskie Safe Line provides rides to destinations on and around campus from 11 p.m. until 5:30 a.m. every day, while the trained students of our Huskie Patrol are available from 8 p.m. until 4 a.m. to walk you to your residence hall, to your car or anywhere else on or near campus. We are also particularly proud of our police force. Every one of our officers is a certified Emergency Medical Technician, and every shift includes at least one officer who is a fully trained Paramedic. Not many police departments can say that, added Phillips. Phillips is particularly proud of the department’s Community Oriented Policing Strategies (C.O.P.S) unit, specialized officers responsible for community safety education and liaison to NIU’s Cultural Centers and Greek community. To learn more about why Northern Illinois University was named one of the safest large college campuses in the nation, visit the website of Department of Police and Public Safety.